Would you recommend a 2010 with 40,000K? I own a 2010 GTS AWD with about 38,000. miles. Best car I ever owned. Only reservation I would have is that major repairs may be expensive with Suzuki no longer in the country....but having said that....I think that this is a solid, reliable vehicle. 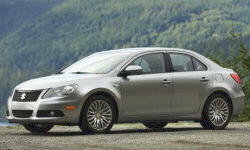 Does the Kizashi have heated mirrors?